As I continue on my road of projects, one that I experimented with was a second hand night stand. I found it at the local thrift store and needed to store some of the extra items that I use for crafting. The color goes well with the color scheme in the dining area, even though I originally bought it for my bedroom. The great thing about white and gold, is that it will pair fine if I do move it into my bedroom. Well let's get into this project. Unfortunately, this was a project that I was experimenting with also, and did not think it would go on the blog, so I don't have the original of how the night stand looked in the complete beginning, but you can tell the color with the drawers. It wasn't until after I started priming it, that I was like success or fail, this is going on the blog and started snapping pictures. Why the hammer is in the picture, I am not sure. I did not use it at all. I removed the knobs with a screw driver and sanded down everything. 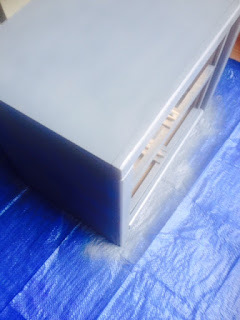 I used 100 grit sandpaper to sand down the original item before primer and I used 150 girt to sand down the night stand after priming and before painting. I must get better at taking pictures during the process, but we all have a starting point for learning. 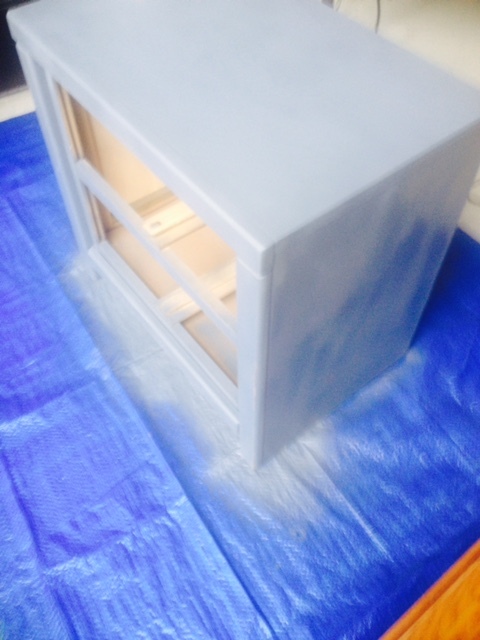 I did paint the entire outside white and most of the work came on the drawers. I also sanded with 400 grit sandpaper in between the white paint coatings and it took a full two coatings of white spray paint. I wish I would have bought white primer, but I wasn't sure what color I was going to paint the nightstand when I originally bought the primer. 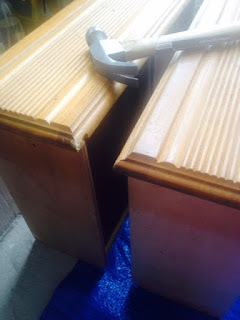 After sanding them and priming them (in which I don't have any correct pictures). I placed the painter's tape of the raised areas as illustrated below. As you can see where the red arrows are pointing, after I placed painter's tape over the raised areas, I painted the remainder of the drawer white. I removed the painters tape after painting the entire drawer and let the paint dry. I didn't do the gold trimming the same day, so the paint dried overnight. I did the reverse for the gold trimming, placing the painter's tape over the white painted front areas. After letting the gold paint dry, I reattached the knobs, and spray painted a clear coat over the entire project and let dry. Before moving it back into the house, I let it sit out in the Texas sun to dry and cure for almost two full days and I rearranged the drawers, as I had put them in the wrong place, and that is why it looks fairly backwards on the top pic and correct on the bottom pic. I should have taken more pictures of the process. I definitely should have bought white primer, which would have been less work and less paint. I had a learning curved, where the entire front was going to be gold, and then I had to prime again and correct that to the gold strips that you see. Let's create some holiday looks to slay.